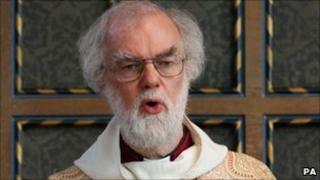 Archbishop of Canterbury Rowan Williams says the US killing of unarmed al-Qaeda leader Osama Bin Laden has left "a very uncomfortable feeling". Bin Laden died in a raid on a Pakistani hideout, and the US initially said he was armed but later corrected that. Dr Williams said that when "faced with someone who was manifestly a war criminal... it is important that justice is seen to be served". But "different versions of events" had done little to ensure that, he added. The US said Bin Laden was a lawful military target and he had made no attempt to surrender. Dr Williams, asked about the death during a press briefing on Thursday, said: "I think the killing of an unarmed man is always going to leave a very uncomfortable feeling because it doesn't look as if justice is seen to be done. "In those circumstances I think it's also true that the different versions of events that have emerged in recent days have not done a great deal to help. "I don't know the full details any more than anyone else does. But I do believe that in such circumstances when we are faced with someone who was manifestly a war criminal in terms of the atrocities inflicted it is important that justice is seen to be served." A spokesman for Archbishop Vincent Nichols, the head of the Catholic Church in England and Wales, said the Church would not be commenting on Bin Laden's death. Critics have raised concerns about the legality of the operation, after the US revised its account to acknowledge Bin Laden was unarmed when shot dead. But US Attorney General Eric Holder said Bin Laden was a lawful military target, whose killing was "an act of national self-defence". "It was a kill-or-capture mission. He made no attempt to surrender." The US has offered two different successive accounts of the killing of Bin Laden. Originally, officials said the al-Qaeda chief had "participated" in a firefight when he was shot dead. On Tuesday, the White House corrected this, saying Bin Laden was unarmed. But it still insisted that he was resisting capture - although it is unclear exactly how he did this. A White House spokesman suggested the initial confusion was the result of trying to provide a great deal of information in haste. The former head of the British Army, General Lord Dannatt, who is a practising Anglican, defended the action of the US special forces. He said that, while ideally Bin Laden would have been captured, his killing was "unfortunate but necessary". Lord Dannatt told BBC Radio 4's PM programme: "The special forces troops going in had been briefed, perfectly reasonably, that if Bin Laden was anything other than naked, he could be assumed to be wearing a suicide vest. "Unless he put his hands straight up and surrendered straightaway they had to assume that he had evil intent."